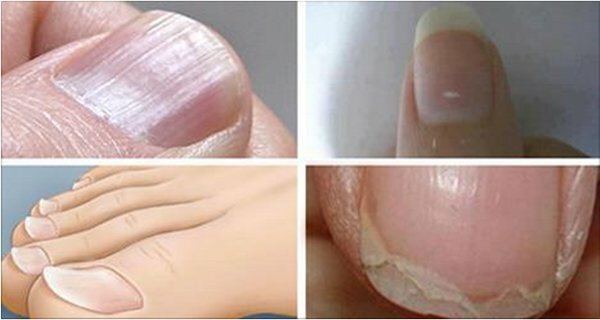 7 Nail Conditions Linked to Serious Diseases! Do Not Ignore Them! Home » Health » 7 Nail Conditions Linked to Serious Diseases! Do Not Ignore Them! Take a close look at your fingernails and observe how they look. Are they strong and healthy or do you see ridges, dents, or discoloration? Many such undesirable nail conditions can be avoided through proper fingernail care. As these conditions might indicate an underlying disease or nutrient deficiency that demands attention. These can fall anywhere between anemia to thyroid disease. Nails are one of the last ones to receive nutrients that we take and therefore, care is of utmost importance. Our fingernails are composed of laminated layers of a protein called keratin which grow from the area at the base of the nail under the cuticle. Healthy fingernails are smooth, without any brittleness, ridges or dents. They’re uniform in color and free of spots or discoloration. Solution: oral medicine Biotin (a vitamin) should be taken for at least 6 months. Available in 1mg size and smaller the medicine should be taken 3 times a day to get started. Pregnant women should avoid taking this drug. Though Biotin is the most reliable, but calcium, colloidal minerals, and/or gelatin may also be of some help. Causes: vitamin or mineral deficiencies as well as general malnutrition or other illness if they run horizontally. Solutions: Use few drops of almond oil to polish the nails and a chamois buffer so as to remove the upper thin layer of the nails. This should be done every week to keep this condition from recurring. Causes: some conditions a high fever, nutritional deficiencies, psoriasis, or trauma from surgery can affect the nail growth and create some dents. Solutions: the recommended daily allowance of protein which is 55 grams should be consumed on daily basis. Solutions: 400 IU of vitamin E twice every day can prevent discoloration. Oils like Almonds, hazelnuts, peanuts and wheat germ oil are additionally great antioxidants. Causes: Yeast or microorganisms that develop when the nails are consistently under warm, damp and wet environment. Toe nails are most affected in these conditions. Solutions: Soak nails in antibacterial tea tree oil for 15 minutes a day until the parasite clears. Apple cider vinegar is also an excellent solution for the same. Causes: Nail injury or zinc deficiency. Solutions: Nutritionists prescribe 50 mg of zinc every day. Zinc is also available in red meat, sesame seeds, pumpkinseeds, and peas.